Student centers. Dorms. Library. Academic buildings. Sports facilities. And even Starbucks. 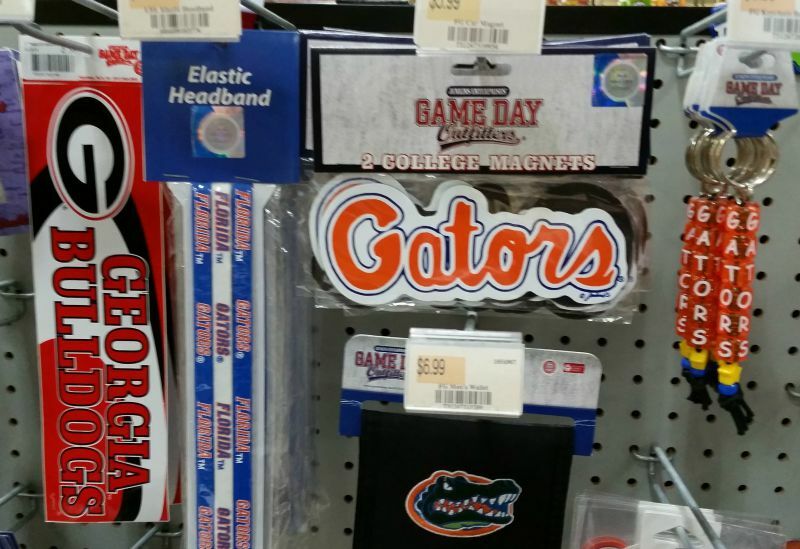 My high school senior saw it all on her #CollegeTourCation. The College Tour is in full swing. This is my second ride on the “College Tour Bus” with a child. The first College Tour happened two summers ago when Child #1 toured colleges in Pennsylvania, North Carolina, and Virginia. After many college visits she settled on a college in upstate New York that she had never visited. Go figure? Once Child #1 was settled in her college dorm, I headed home. I thought I would have a break for a while, but It wasn’t long before Child #2 then a junior in high school mentioned that she wanted to do college tours. So much for taking a break! I took a deep breath and waited to see where Child #2 wanted to visit. Child #2 informed us that she wanted to tour colleges in West Virginia and Pennsylvania, which she did in the spring. These day trips sparked her interest. Soon she wanted to road trip to more colleges. 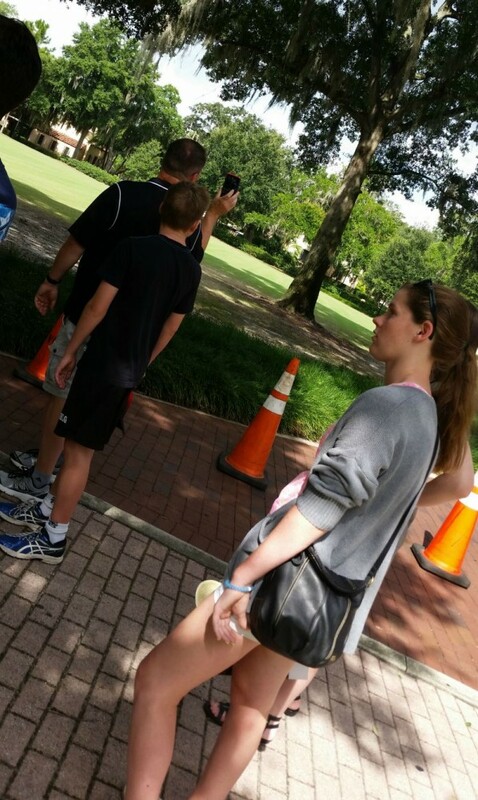 We decided to combine a tour of colleges with a much-needed family vacation. The #CollegeTourCation was born! One of many roadside stops on the Musings from Me #CollegeTourCation. So, the #CollegeTourCation Was Born! With a minivan packed to the rafters with 2 duffle bags, 3 rolling suitcases, 5 backpacks, blankets, towels, drinks, and snacks, we set off on our #CollegeTourCation to North Carolina, Georgia, Florida, South Carolina, and back through North Carolina home to Maryland. Drove from Maryland to Hickory, NC. Long day of driving — 8 hours — drove briefly through Virginia, then West Virginia, before entering North Carolina. After stops at Sonic in Frederick, MD, and Godfather’s Pizza/Subway in Hickory, NC, we arrived at our Hotel #1. Fast food restaurants are a necessary part of a tightly scheduled trip. 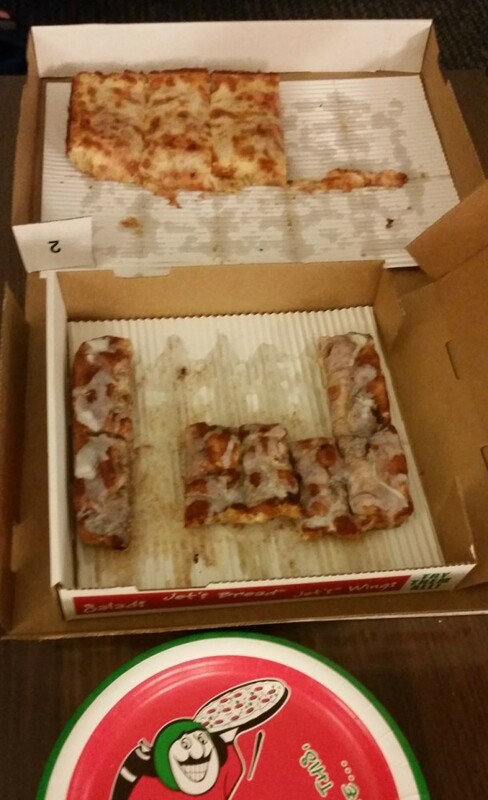 Don’t worry…we ate a few more healthy meals a long the way! Hotel #1 was the first of three Hampton Inns we stayed at on our #collegetourcation. The free hotel breakfast buffet is budget friendly for my family. Breakfast for 5 is pricey. Woke up to yummy and free(!) Hampton Inn breakfast. The free breakfast is such a savings for my family of 5. All the kids eat of the adult menu these days so not having to buy breakfast for 5 each morning is very budget friendly. No hard boiled eggs at the breakfast buffet…my all-time favorite breakfast item that I can only find at a Hampton Inn…but otherwise a great breakfast. Drove to College #1. Great tour of a beautiful college campus led by an enthusiastic and knowledgeable tour guide. As if one college tour wasn’t enough, we pushed and made it to College Tour #2 with minutes to spare. Due to a mix up, we got a private tour of College #2 from a very funny tour guide. During our #CollegeTourCation we toured SIX colleges! Two college visits (College Tour #1 and #2) were done in just one day. Phew! Left North Carolina around dinner time and motored to Atlanta, GA, with a brief pit stop in South Carolina. Had our first dinner at Zaxby’s, a chicken fast food restaurant just over the Georgia line. Six hours later we checked in to the Hyatt Place, just outside the city of Atlanta, GA. 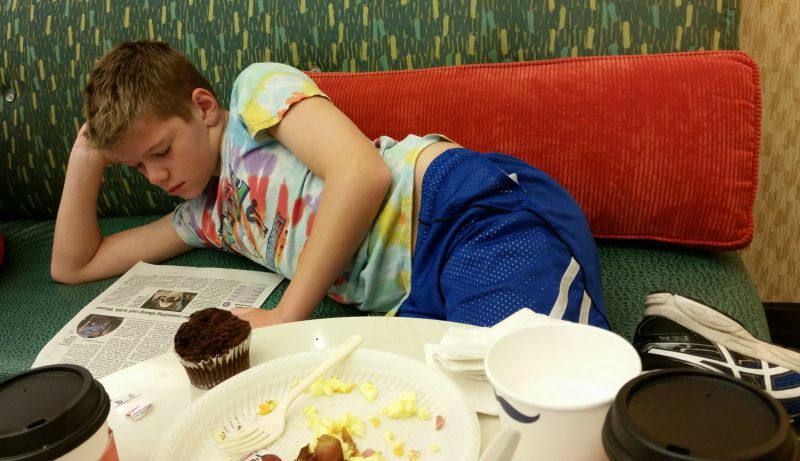 Relaxing with the newspaper at the Hampton Inn breakfast buffet. 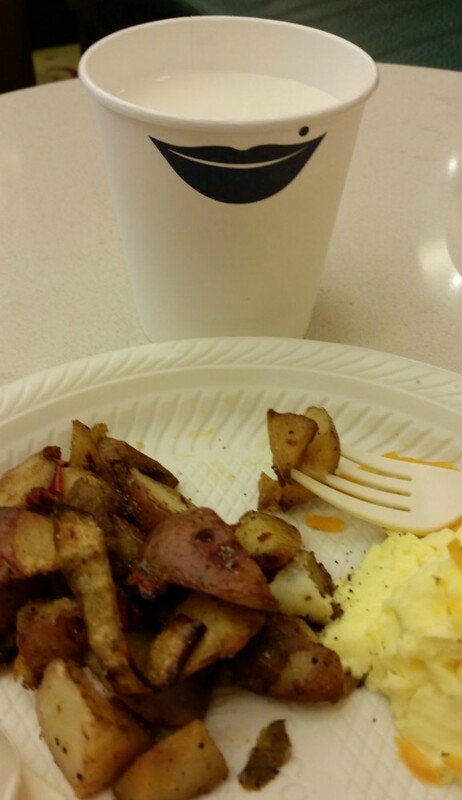 The Hyatt Place free breakfast buffet was the best free buffet at ANY hotel. The buffet was set up like a kitchen with plates and coffee mugs on shelves around the breakfast buffet room. Took me a moment to figure out where the plates were! There was even an antigriddle keeping the juice jugs cool. Very high end! I tweeted about the antigriddle and the hotel responded. This hotel was on top of the social media game! After checking out, we drove about 20 minutes to the Olympic Park area of Atlanta. Found a parking space easily in the lot adjacent to the World of Coca Cola, next to nearby attractions: Georgia Aquarium, Centennial Olympic Park, and more. Toured World of Coca Cola from 11:30 a.m. until 3:30 p.m. The World of Coca Cola is on two floors. Be sure to see every exhibit. Must-see exhibits at World of Coca Cola: the Vault of the Secret Formula; Milestones of Refreshment; Bottle Works, a replica of a bottling plant assembly line; the 4-D interactive movie; the Pop Culgture Gallery; and Taste It! Taste It! A visit to the World of Coca Cola wouldn’t be complete without drinking a few samples, would it? We love factory tours and samples! We sampled Coca Cola products from around the world…North America, Latina America, South America, Europe, and Asia. I tasted about 30 drinks. My teen tried closer to 50. Even my non-soda drinker tried about 7. My son and I had fun completing the World of Coca Cola Passport Challenges. Hint: Get your passport stamped at the exit of each exhibit as there is a treat for you at the end. Our group of two adults, two teen girls, and a tween boy enjoyed the exhibits at the World of Coca Cola. Drove to Ocala, FL, with a pair of pit stops at one our favorite fast food restaurants of our #collegetourcation, Steak-N-Shake. The Nutella milkshake is amazing! Another couple of pit stops were needed to find a fuse for a blown car phone charger. We stopped at Sears for a tool and a couple of auto supply stores to find the fuse. The mood in the minivan when two adults, two teens, and a tween were low on power with no working charger was grim. We were all SO excited to see the red light on the car phone charger light up! Stayed at Comfort Suites in Ocala, FL. Our vacation tradition is to order pizza from a local pizza place, such as Jet’s Pizza near Orlando. The free breakfast buffet at the Comfort Suites in Ocala, Florida was very good! Toured Silver Springs National Park, home of the glass-bottomed boats and a beloved family vacation destination for my husband’s family. He spent many a summer day at Silver Springs State Park in Ocala, FL. Funny moment #1 of our Silver Springs trip: I kept teasing my husband that we would arrive at Silver Springs to find that the place was closed down after all these years a la Wally World from national Lampoon’s Vacation. Funny moment #2 of Silver Springs State Park: When my husband mentioned to the parking lot attendant that he hadn’t visited in 35 years and she wanted to let him know that they no longer had alligator wrestling! After Silver Springs State Park we drove to College Tour #4 with a detour to the Gulf. After driving up and down a coastal highway, we gave up as we couldn’t find a beach access road. Oh well, we gave it a shot. We did College Tour #4 during a monsoon. We had a driving tour in one of the college minivans. At least we stayed dry! Drove to Altamonte, Florida, and stayed at Hampton Inn & Suites. The first 3 nights of our #collegetourcation we arrived at the hotel late. At this hotel, we arrived early enough to have a swim in the pool, exercise in the hotel gym, and order pizza from a local pizza joint. Ahhh…it was SO good to relax after 3 long days of driving, college touring, and sightseeing. 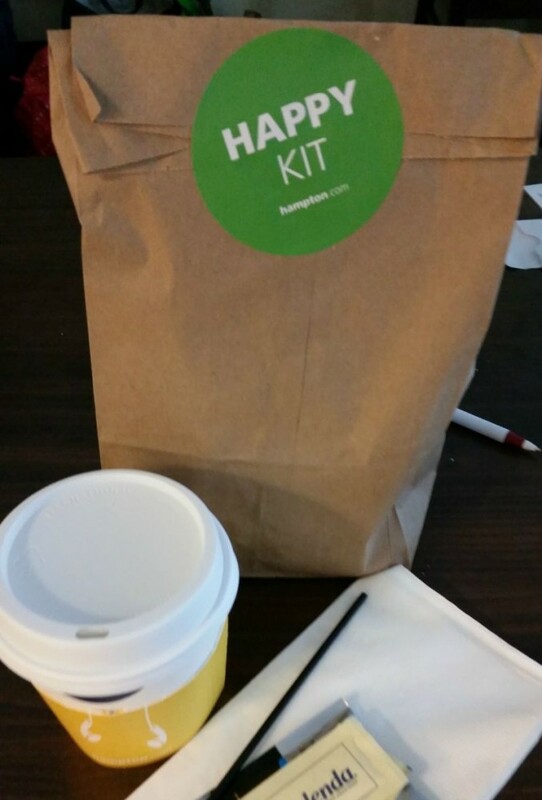 On mornings when we couldn’t wait for our teen to eat breakfast, we grabbed a To-Go Breakfast for her from Hampton Inn. Each brown bag had a bottle of water, an apple, a muffin, a granola bar, and mints! Checked out of the Hampton Inn in Altamonte, Florida, and drove to Daytona International Speedway. We wanted to spend two nights at the Comfort Suites in Ocala, but the hotel was booked so we spent a night at the Hampton Inn in Apopka, Florida…literally the next town over from Altamonte our Day #4 hotel. Awkward…but you do what you can on a road trip where you are booking hotels the night before AND you need to find a hotel with suites for 5 people! The Daytona International Speedway was a very fun. We took a trolley ride around the speedway from track to briefing room to media area to the spectactor stands. From the Speedway, we trekked to see the Atlantic Ocean. We tried on Day #4 to see the Gulf, but had no luck. We were close but couldn’t get beach road access. Daytona International Speedway is a short drive from Daytona Beach. I was very surprised to find that the beaches of Daytona have an admission fee, but delighted that the admission fee allowed us to drive on the beach. That was $10 was well worth seeing the kids’ faces as they gazed at the Atlantic, paddled in the water, slurped ice cream cones, and took Instagrma selfies and Snapchat Stories. What can I say, if you take a teen to the beach or anywhere expect LOTS of selfies. After Daytona Beach it was a stop at Steak-N-Shake. Our #3 stop at Steak-N-Shake for those who are counting! We munched on burgers and slurped shakes on our way back to Apopka, Florida. This time I got a Salted Caramel Shake-N-Shake that was very good! We arrived at the Hampton Suites in Apopka, Florida, which was the next town over from the Hampton Inn we stayed at in Altamonte on Day #4 of our #collegetourcation. Another excellent pizza from local pizza place, Jet’s Pizza. Driving over 2,500 miles, we stopped at MANY restaurants and fast food places. 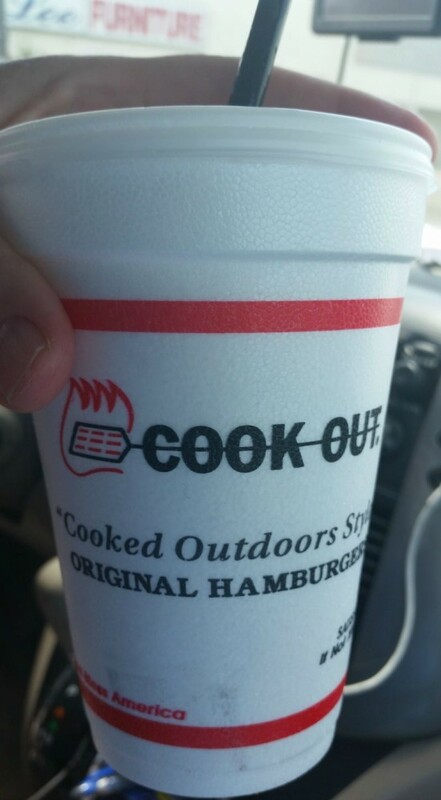 Cook-Out, a BBQ and hamburger joint, was one of our favorites in North Carolina. By this point in our #collegetourcation we were very familiar with the free breakfast buffet. The Hampton Inn (Apopka, FL) breakfast room was light, airy, with a beach theme. Another hotel checkout…hotel checkout #6 for those counting…it was off to College Tour #5. We arrived at the college early, nabbed a space in front of the admissions office, and had a great tour. Beautiful campus. Information-rich tour guide. After a quick stop to purchase a college t-shirt and stop for Steak-N-Shake #4, our #collegetourcation continued with a drive-by tour of College #6. Next stop: Melbourne, Florida, near the Kennedy Space Center and port stop for many cruise lines. Not surprisingly it was next-but-not-entirely impossible to get a hotel room in Titusville, FL. Only snag with the Holiday Inn we booked was that the hotel website was glitchy and we booked a room with 2 queen beds instead of 2 queen beds and a sleep sofa. After a few calls to the front desk we got a rollaway bed, which turned out to be less comfortable than the other 5 sleep sofas my son slept on. You wouldn’t think that a sleep sofa would be more comfy than a rollaway bed, but it was. My son with two older sisters took one for the team and slept on the sofa bed in the hotel suites we booked. His sisters were thrilled to sleep in the queen bed rather than the sleep sofa…I told them to keep a lid on their excitement! 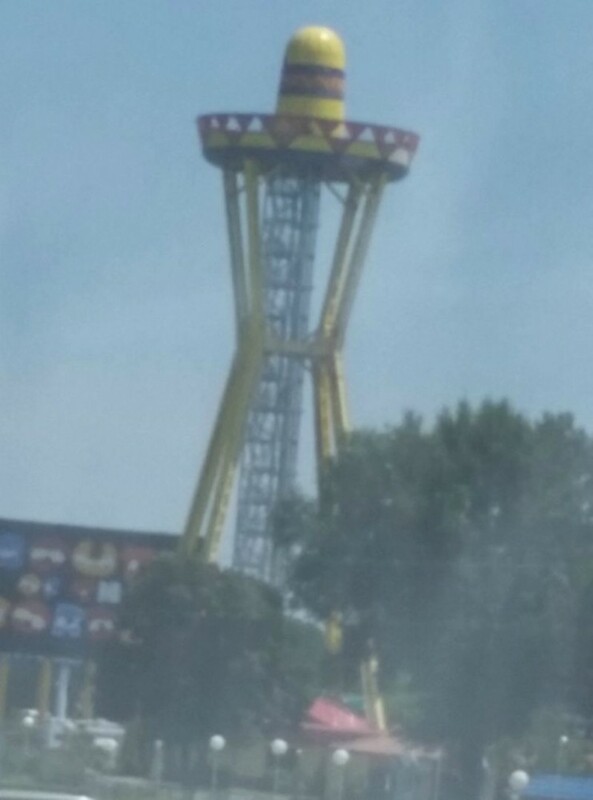 A Southern road trip wouldn’t be complete without a stop at South of the Border on the NC-SC border. We were in a rush so we didn’t stop. Breakfast was not included at the Holiday Inn in Titusville, FL. Drat! After 5 free breakfasts in a row, we balked at buying breakfast. The free breakfast offered by many hotel chains is a good deal for my family of 5. Very budget friendly! We trekked to find a Waffle House, but eventually settled on McDonald’s as we wanted to get to the Kennedy Space Center in Cape Canaveral, FL. We knew that the Kennedy Space Center tour would take 6-8 hours, so we didn’t want to waste any time. The Kennedy Space Center at Cape Canaveral was amazing. The tour was in depth, the exhibits educational, and the tour guides knowledgeable. All in all a great stop on our family’s #CollegeTourCation! We reluctantly left at 5 p.m. After 7 hours of fun at the Kennedy Center we could have stayed for a couple of hours more but needed to start our journey home. Sigh. Sadly all #collegetourcations have to come to an end. Stopped for snacks at a gas station. Left my Diet Dr. Pepper on the counter. Pout. Stopped for gas and another Diet Dr. Pepper. Drove to Walterboro, SC. Since my husband didn’t know how far we would get on our drive home, he wasn’t able to book a hotel room. I booked one close to midnight. Stayed at Quality Inn & Suites, Walterboro, SC. After driving every single one of the over 2,500 miles my husband — @DadKnowsBetter — was exhausted by the time we checked in to our hotel each evening. 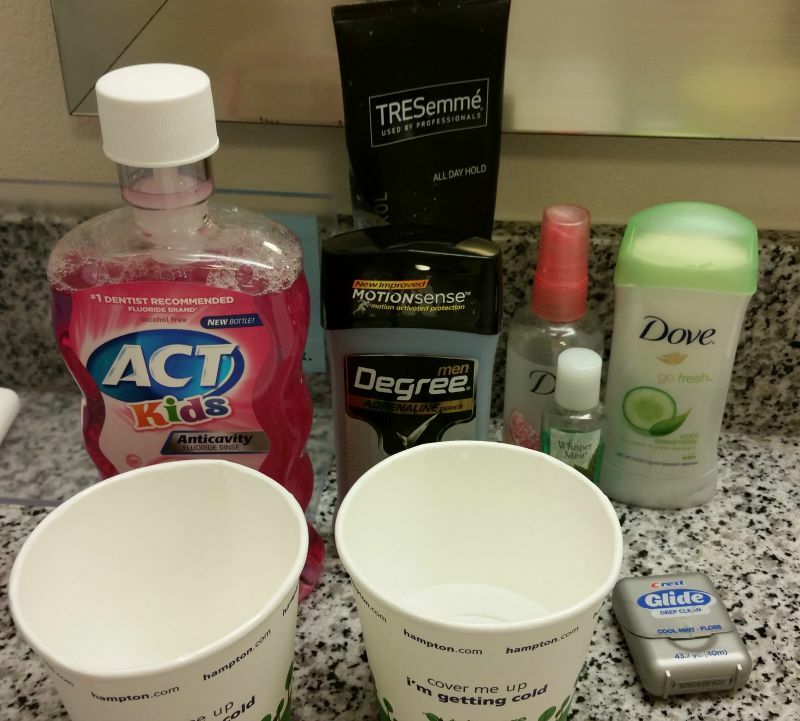 Once in our room, I set up the bathroom area with all our toiletries, put out the snacks, chilled the sodas and water in the fridge, and ordered pizza. Breakfasted at Waffle House following checkout, which was a must-see for me. Crossed over the South Carolina border in to North Carolina past iconic rest stop South of the Border. Visited College Tour #6 in North Carolina preceded by a stop for lunch at Cook-Out. My first sighting of a person carrying a gun in a holster. First time in an open carry state. The drive home from vacation is always long. The driver was tired. The kids were ready to be home. I had loads and loads of laundry to do. Arrived at home in Maryland after a stop at Sonic somewhere in Virginia. Gosh, we love Sonic!